Adds the ability to listen to audiotapes, CDs and all recorded media. You will supply a sound system producing 10 watts per channel. If you will want speakers, install them when you first put up your tank since they go on the bottom. If you use a timer to start your pump (as in the professional timing system or outside of the USA), a motor starter is important to protect your motor.The optional Motor Protector is highly recommended if you are going to start the Filtration System when you are not physically present. Sometimes one drifts to the side of the tank, touching a wall. To prevent this we devised a unique system of custom heaters that produce a convection current in the water to keep one constantly centered in the tank. This is good for all high budget installations. Use as a "drip zone" in front of your tank for those who don't have the shower right there. Specially made for us, 25 1/2" x 28 1/2" x 3", white. You can lay a towel inside for quick cleanup. Highly recommended for "housekeeping". Allows you to conveniently control and time various electrical equipment connected to your tank (such as the filtration system or a sound system). Besides timing the filtering of your solution, it is used to let a floater know their time is up by switching on a Digital Alarm or a Sound System. This is very useful to use for one float a day. For more floats a day, get the Professional Timing System. Comes with the ability to control 2 pieces of equipment, one low wattage and one high wattage like the Filtration System.You can increase the number of pieces of equipment that is controlled by getting more Remote Switches. For noisy locations. Laying these 11 pads on the floor is the first step in tank installation, but only if you need them. 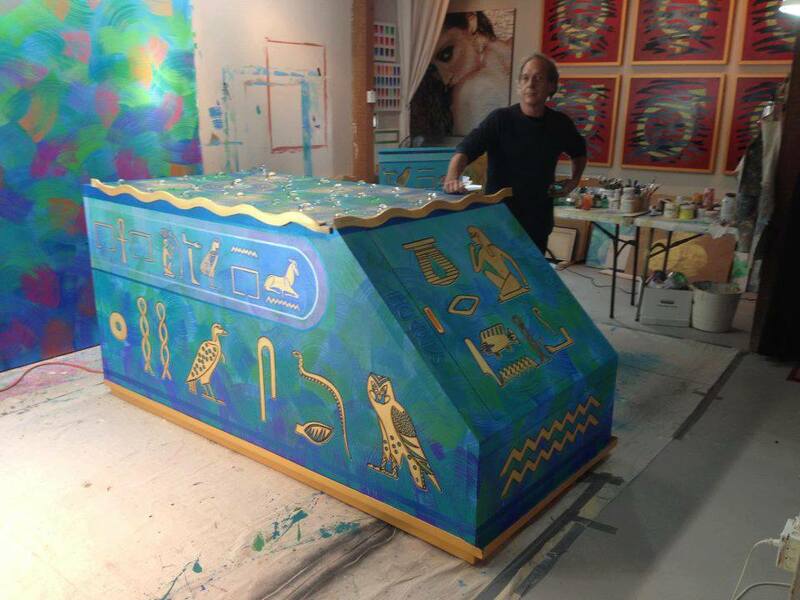 They separate the tank from some of the vibrations coming up through the floor. This helps a lot in noise generated by traffic. It sounds silly but if you put your ear to the floor you can hear the sounds that are amplified through the floor. You supply a 1" thick sheet of 4' x 8' plywood to put between the pads and your tank bottom. This light is installed below the water line, (it looks like a pool light),and comes with its own air switch so it can be safely turned on and off from inside the tank. This is extremely convenient if more than one person is using a tank. It allows adjustment for different temperature preferences for each person with switches inside and outside the tank. Keep your water temperature at the lowest setting,(93 F) and those who want to be warmer can adjust the ambient temperature for their comfort. It is also very smart to provide this option in a public setting. An addition to your filtration system that adds the sterilizer ozone to the tank solution to minimize the addition of chemicals. 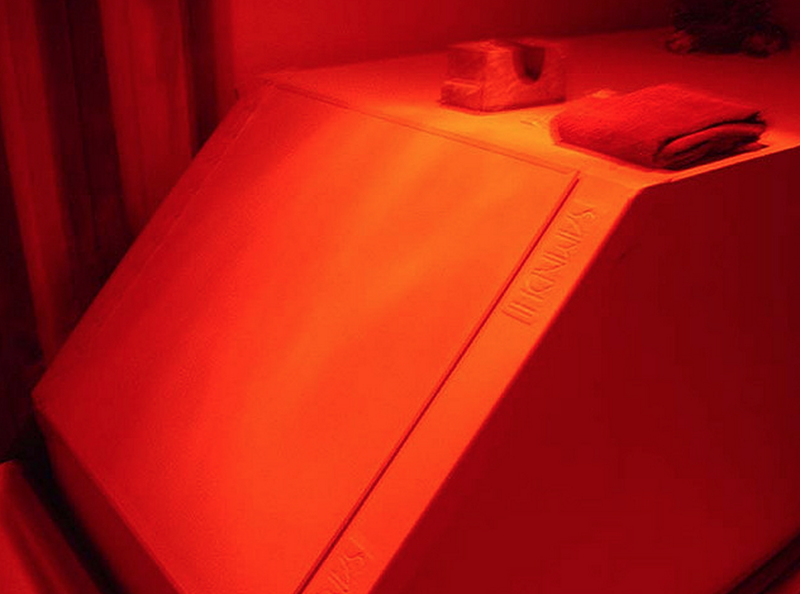 If you have a tank in your business it is wise to use either this or an ultraviolet system. A cosmetic treatment of the tank maintenance department - pump, filter, hoses, and cords. Easy to get into for service and it is made of the same material as your tank so it looks excellent. A system of microphones that allows talking between the floater and someone outside the tank. This is a specialty for use by therapists or researchers. If you have a professional office where tanks are one of many services offered, and you want everything to be handled automatically leaving the staff free to work with clients rather than adjust timers. Press a button when someone enters a tank room and the system is activated. The system turns on music signaling the end of the float, then after 1 or 2 minutes starts the filtration system getting the tank ready for the next floater. You can set this up on your PC or on a module we supply. When you place your order, let us know whether or not you have a PC. You install this when you install your tank. The first tank is full price and all succeeding tanks are less costly. This gives temperature readout only. You will want to offer these to your clients when you have a public tank. Not everyone uses them but they are a necessity for those people who cannot let water into their ears. Manual,"So You're Planning a Center"
If you're thinking of going into the tank business, this is useful. It doesn't advise you to go into the business, it helps you decide whether you want to and gives you important information about this business. 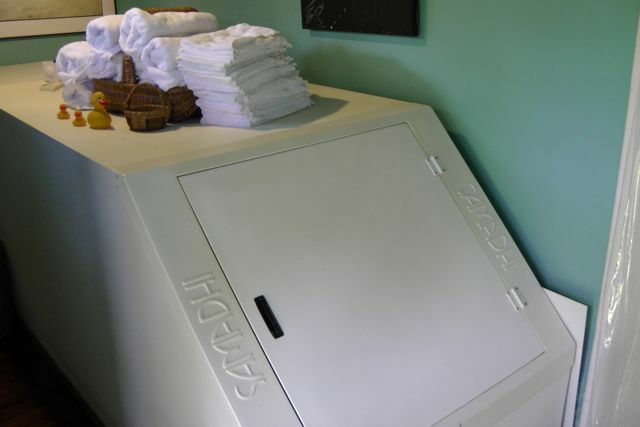 "Tanks for the Memories: Floatation Tank Talks"
If your electrical system is different than the USA electrical system, ie: 110 Volts, 60 cycles, you must purchase the Samadhi Classic International Model. We ship approximately four weeks from the receipt of your order. Shipping to other countries can be arranged by air or by sea. Shipping is freight collect. There are sometimes special circumstances in effect that can speed up or delay shipping.